This Straight Shootin' Gear Review is a two'fer special. In the following multi-part video review, I'll show you how you can exceed the capabilites of a high-end mapping GPS with the plain-Jane Garmin eTrex H GPS and the TOPO! 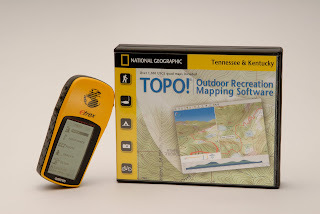 State Series topographic mapping software from National Geographic... at a fraction of the cost. I chose to review these two products together because in my method of using them, they are a tightly (though manually) integrated duo that I depend on for outdoor navigation and for recording important details of my scouting and hunting trips. Any decent GPS can help get you where you are going and back in the woods, but only by adding the capabilities of a custom topographic mapping tool will you be able to create historical views of important details like feeding areas, bedding areas, trails, rubs, and scrapes. You can even attach photos and custom notes that can be viewed with a simple click of the mouse. As an added bonus, I'll also show you the terrific Adventure Paper that lets you create totally waterproof, nearly indestructible custom topo maps straight from your inkjet printer. Remember, no GPS is a substitute for a topographic map, a compass, and the knowledge of how to use 'em. If you are a newcomer to using those two essential outdoorsman's tools, or if you just want to refresh your memory, take a look at this article about topographic map basics then this article on compass basics and this article where I show you how to use them together. Update: This article shows how I use the system out in the field. I have a few questions on the mapping software. Fire away. I'll do my best to answer. Do you use a 3rd party program to get you etrex to talk to your computer? I have the same GPS as you but can't get it to down load the way points I collected. Thanks! Never mind! I got it. I'm also using some stuff I learned from the august 2010 Field and Stream. It's about google earth functions. Imbedding video and pictures at waypoints. I can send an eg if your interested. John. I have not been able to get my eTrex to communicate with my computer. I transfer the data manually. The good news is... I just got a new Garmin GPSMAP 62s that is really sweet - and it communicates with my PC. I'll be doing a gear review on it once I have learned more about it. Looking forward to it. I've just ordered a really nice compass, http://www.thecompassstore.com/54lu.html, but am going to stick with the Etrex. I've got to spend where I really need it and control the "must have the new" urge. Thanks again for your site. My son and I will apply these principals in the Yanahli WMA and let you know how it works. Do you know if the software is compatible for mac? man i used your system and it works great with the gps and software discribed. i thank you for the great informations.